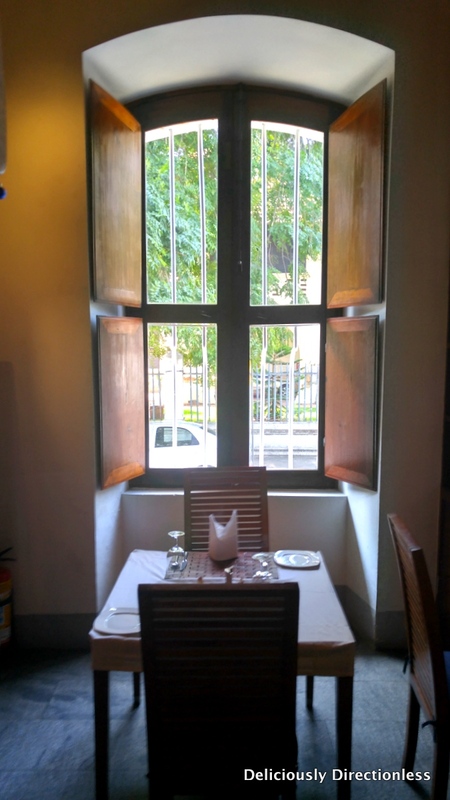 Here are my recommendations on eating out in Pondicherry. 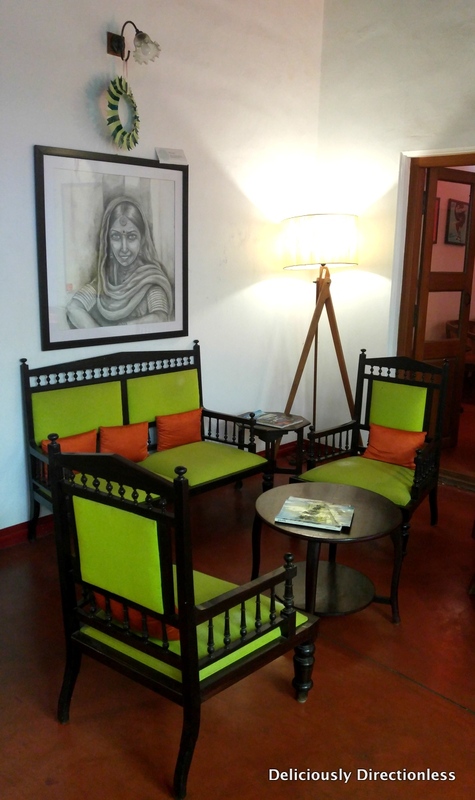 For a list of best cafes, see my previous post Smell The Coffee: Pondicherry. Most of these restaurants are located in the French Quarter since we stayed at a hotel in this neighbourhood. 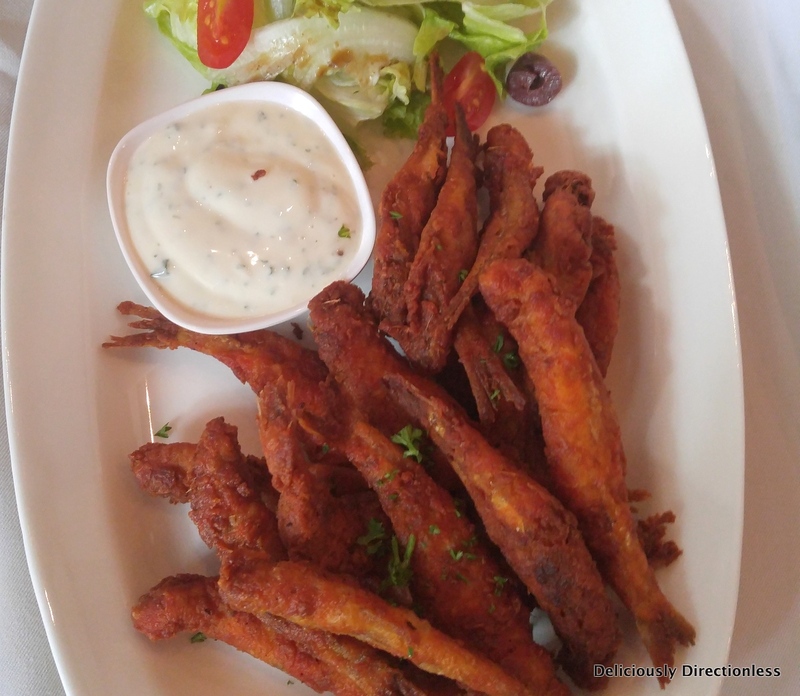 We did venture into the Tamil Quarter once for what turned out to be our best meal! We also tried an ‘eating with a local’ experience, which was stellar. Read on. 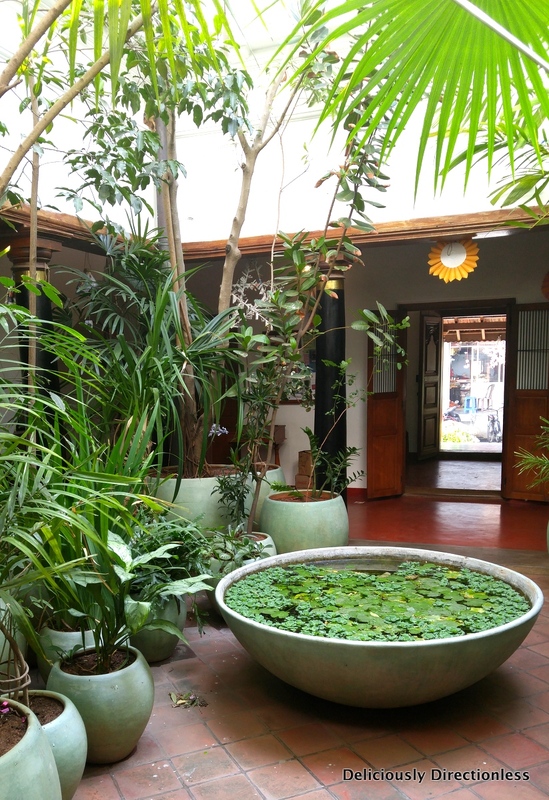 This beautiful boutique hotel by CGH Earth is a restored 130-year-old Tamil-style bungalow featuring a serene, plant-filled outer courtyard, and a restaurant in the inner courtyard. The restaurant serves Tamil coastal cuisine, and every dish we ordered was a perfect medley of flavours imparted by the restaurant’s own hand-ground spice mixes. 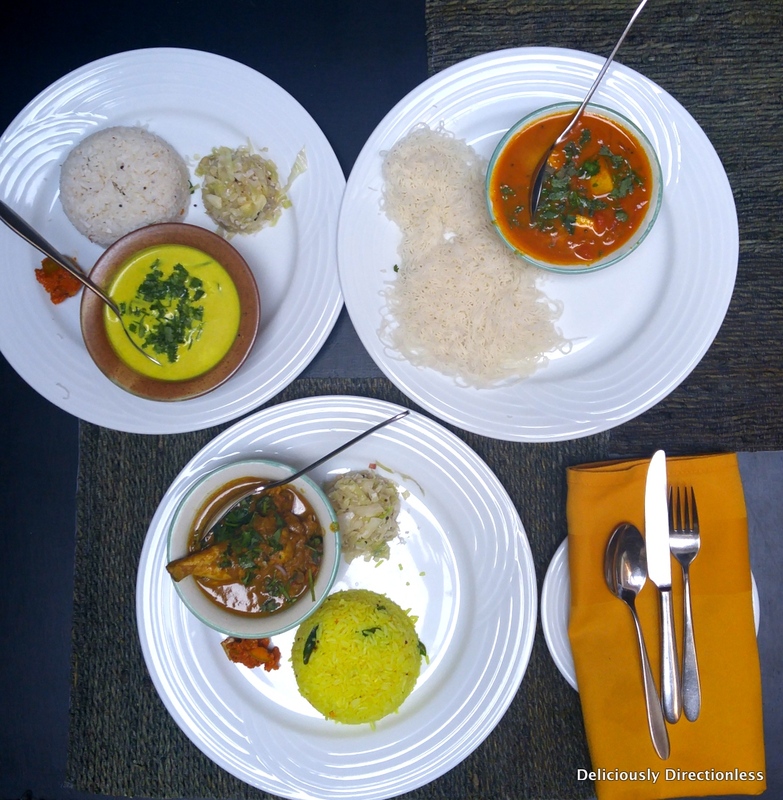 We tried three different curries – the signature Maison Meen Kuzhambu (fish cooked in traditional spices), Vendakkai More Kuzhambu (okra in buttermilk curry), and Chettinad Chicken. All the curries were served with a portion of rice (different varieties like coconut & lemon), and one dish was served with idyappam. 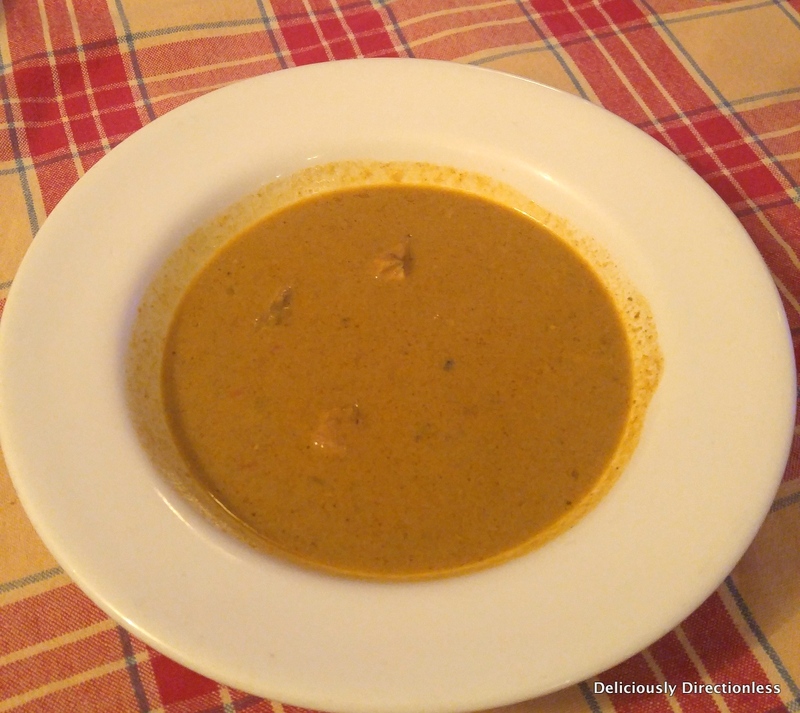 All the curries were flavourful, and the okra curry deserves a special mention for its silky, sublime texture. 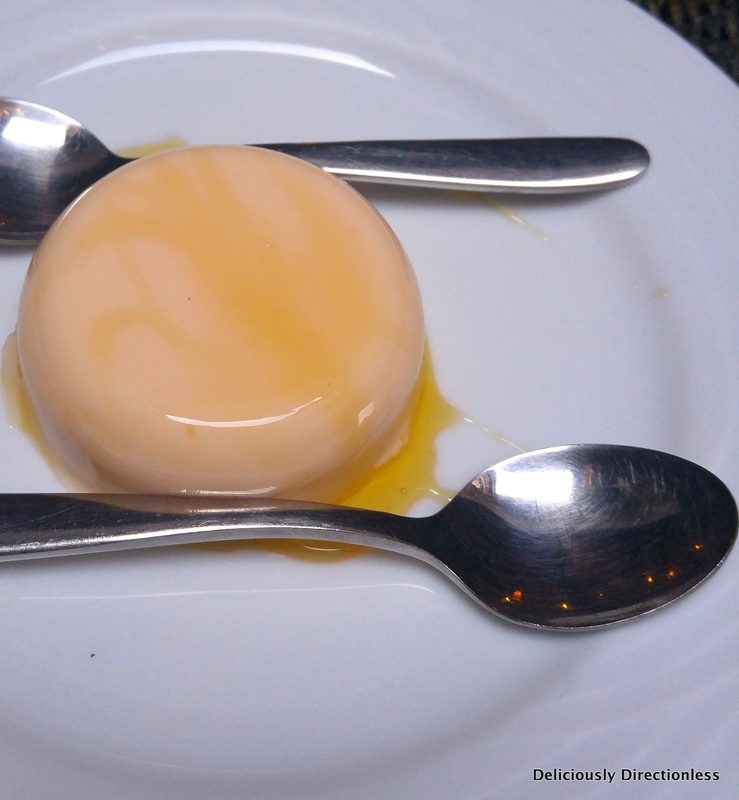 We ended the meal with a perfectly-made, not-too-sweet melon panacotta. 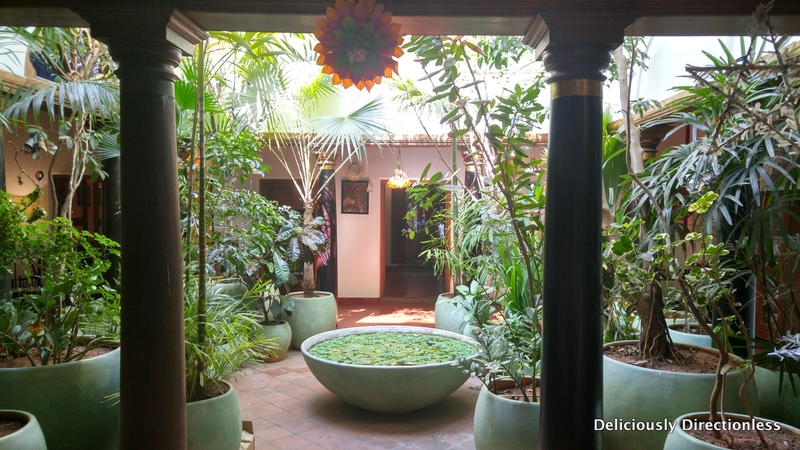 We chose to celebrate our wedding anniversary with a lunch at Le Dupleix, one of the fanciest hotels in Pondicherry. We loved the food so much that we came back for our last dinner in Pondy as well. 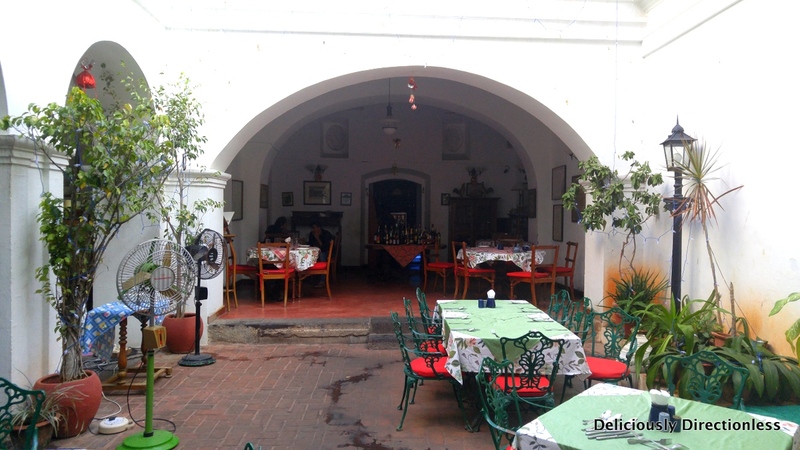 The restaurant has an elegant, wood-panelled indoor seating and a lovely al fresco seating in the courtyard under a mango tree. We tried both, and obviously, the courtyard was a preferred place, considering the cool December weather. 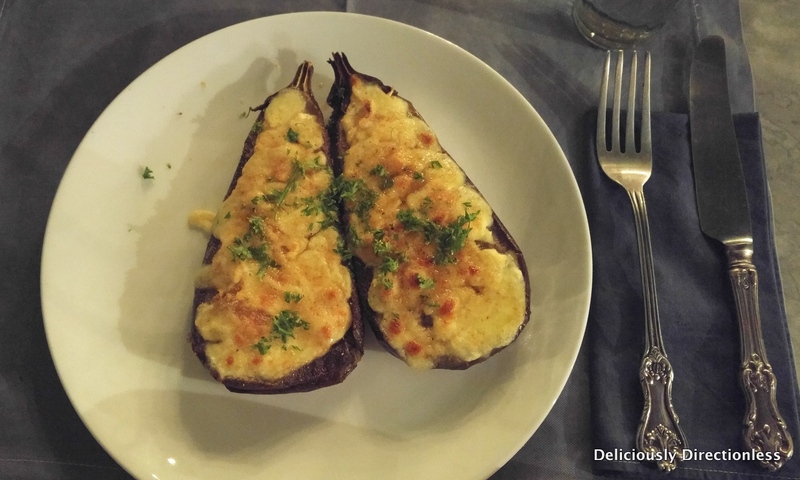 We tried most of the dishes from Le Dupleix’s Pondicherry fusion menu, featuring Tamil-French cuisine. 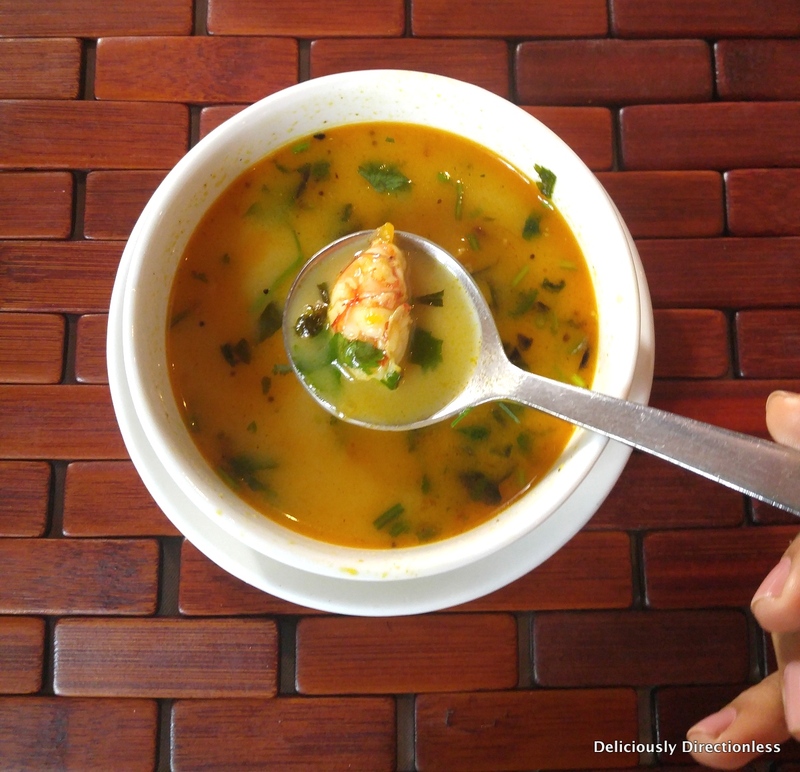 The Rasam aux crevettes was one of our favourites, a smooth, coconut-based shrimp soup, delicately flavoured with curry leaves, which tasted exactly like a warm hug 🙂 Even the Fried Nethili (spicy, deep-fried anchovies) was so good that we ate them like chips! 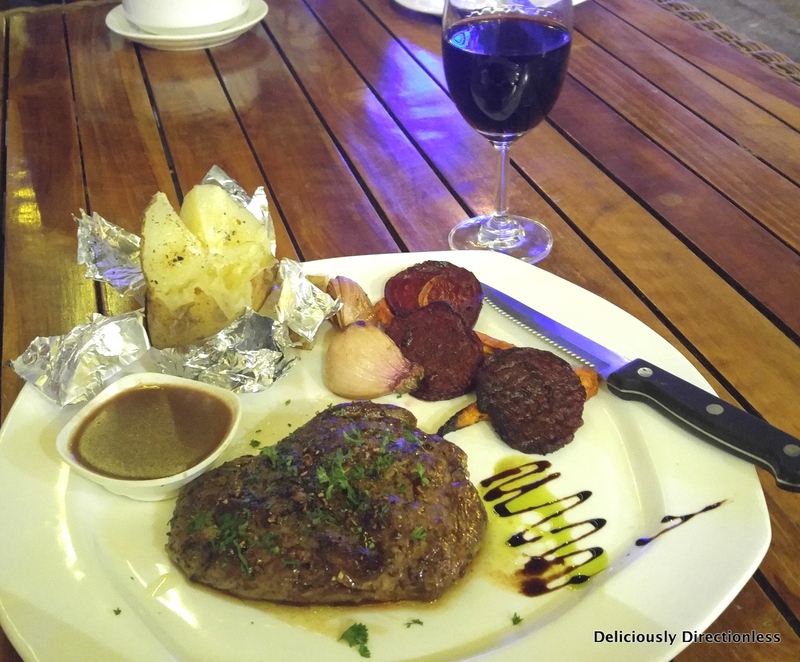 A special mention of the Tawa Pepper Lamb and the correctly done steak that I had for dinner. 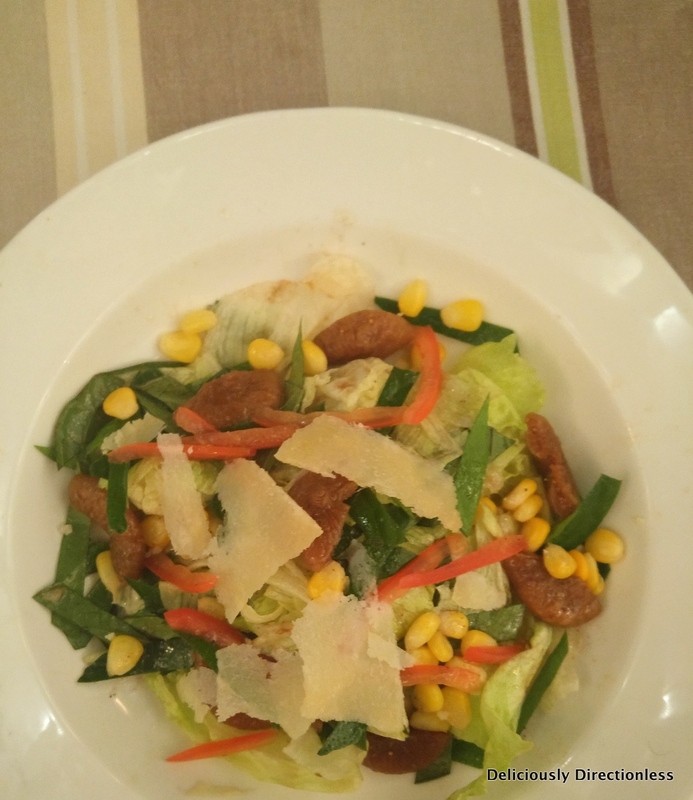 Eating with a local is undoubtedly one of the best ways to taste the real food of any city, so when I came across the home chef Chez Pushpa on Facebook, I immediately contacted her and set up to have lunch at her place when we were in Pondicherry. Her home is located near the Pondy backwaters, about 15 minutes by rickshaw from the French Quarter. My husband & I were warmly welcomed by Pushpa and her family, and we sat down to a fabulous meal with our hosts. Traditional Pondicherry cuisine is a curious mix of Tamil and French flavours, and some form of meat is a must in almost every dish they cook. 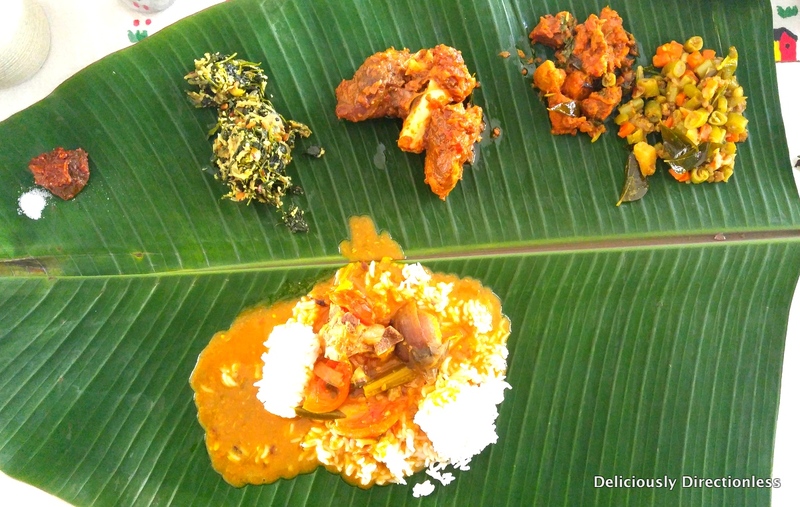 We were served on a banana leaf – a mound of rice with an unusual mutton sambar (!) with aubergines and drumsticks, pork vindaloo (there’s some Portuguese influence as well), mutton pepper fry, a poriyal of carrot, beans, and minced meat, spinach poriyal (the only vegetarian dish on the menu), and a spicy rasam on the side, not to mention a masala buttermilk that was so refreshing and delightful that I had two servings. 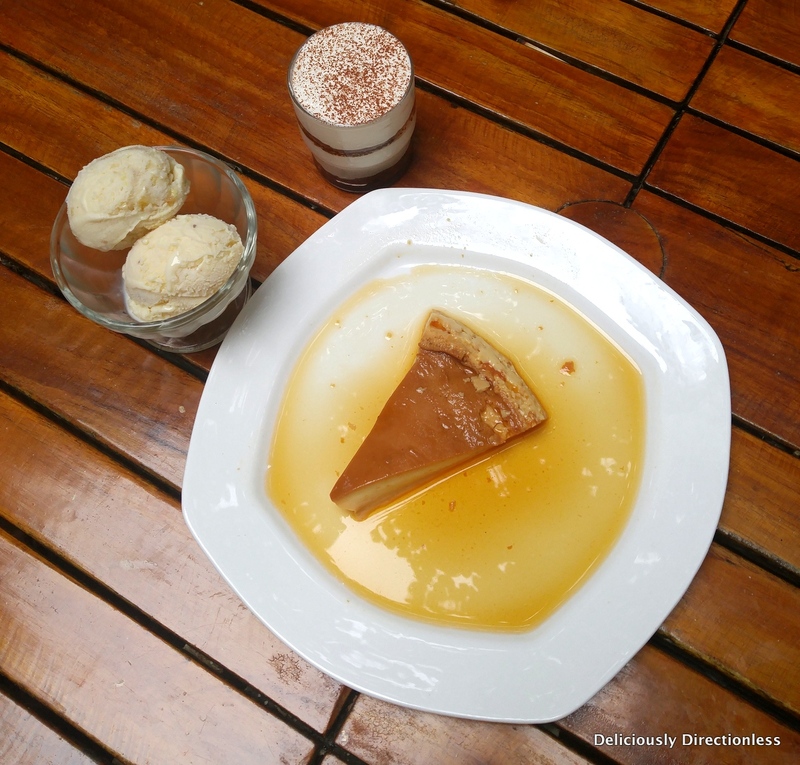 There was some caramel custard to end the meal with, and a hot, strong cup of coffee. All the food was homemade by Pushpa, and absolutely everything was delish; she, of course, customises her menu depending on your food preferences. Probably one of the most popular hotels in Pondicherry… We went for dinner one night & the restaurant was packed; thankfully we had reserved a table. 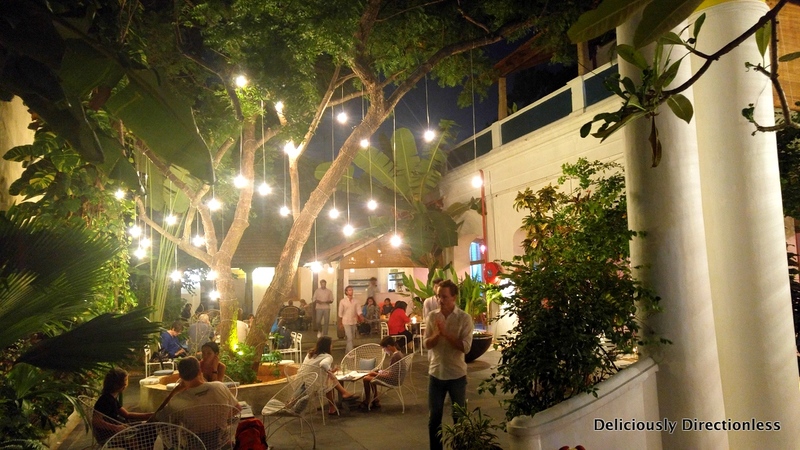 We were seated in the open-air courtyard, surrounded by plants and a vertical garden, and incandescent lighting throughout – really loved the ambience. Food was excellent as well – the unusual betel leaves and figs salad was a refreshing surprise and the sharp betel leaves contrasted beautifully with the figs (I would have preferred fresh figs instead of dried ones, though). 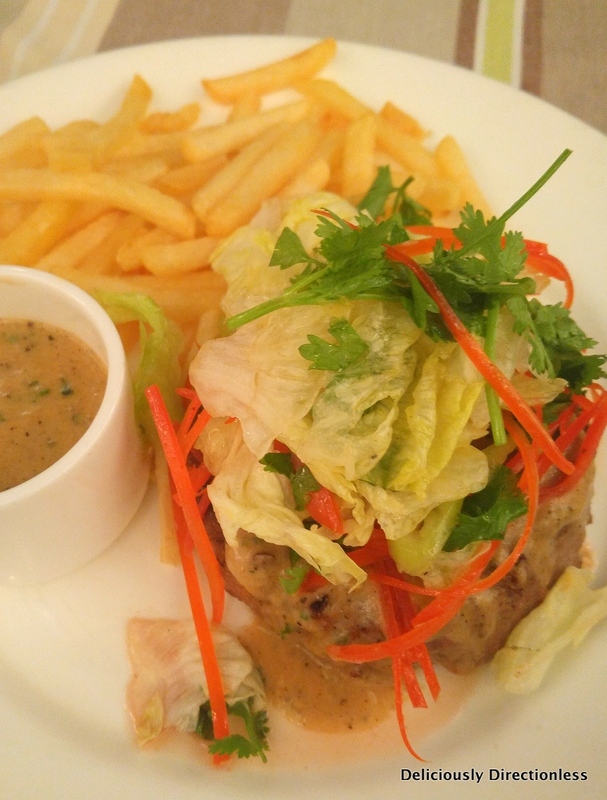 We tried the minced beef patties, which were tender and flavourful, served with a pepper veloute sauce and, of course, a pile of French fries. 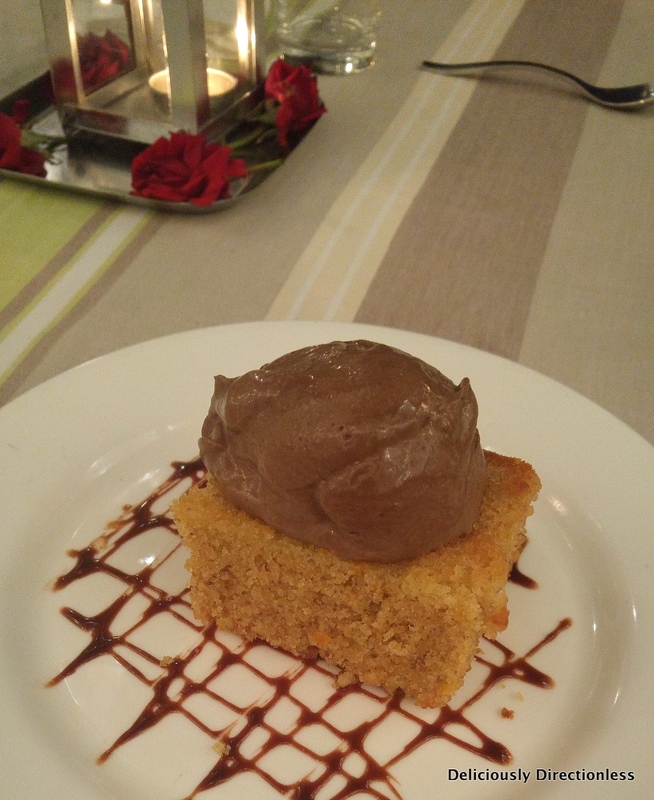 For dessert, we picked the chocolate & almond cake, which was slightly dense and the accmopanying chocolate mousse didn’t quite go with the cake. Another French mansion converted into a boutique hotel, this one was just down the road from our hotel. Again, we had dinner under the stars in the courtyard of the hotel. 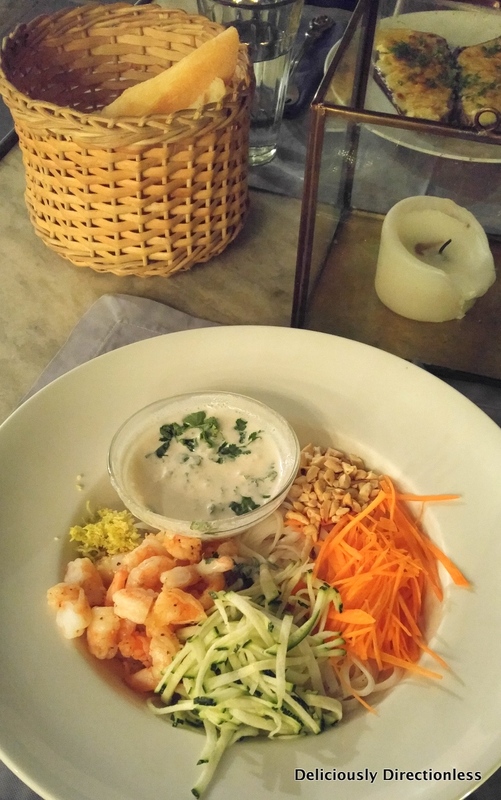 This was a très light dinner – just an Asian-style prawn salad with rice noodles, veggies, peanuts and a coconut dressing, very fresh, very light, and an eggplant moussaka with feta and mozzarella. We also had the New York cheesecake, which was overly creamy and the cream cheese didn’t seem to have set properly. 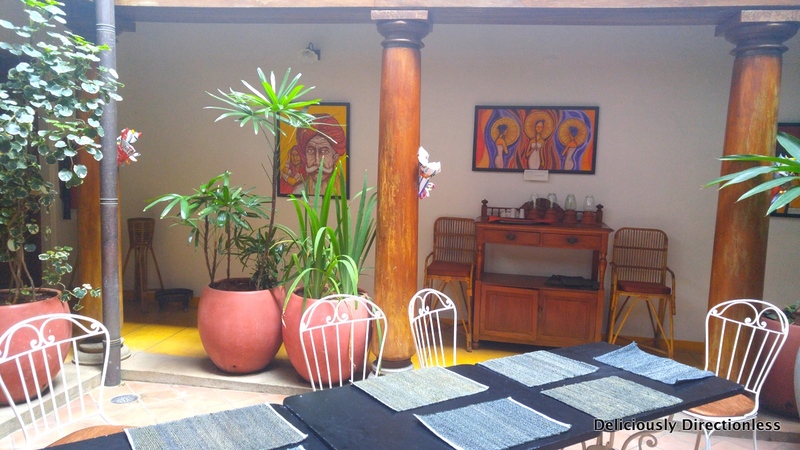 This is the Creole restaurant at Hotel de L’Orient, the first French mansion to be converted into a boutique hotel, which is now run by the Neemarana group. Numerous blog posts & articles listed it as a must-try restaurant, so we decided to head there for our first dinner in Pondy. The menu lists several ‘creole’ dishes – a fusion of French & South Indian flavours. 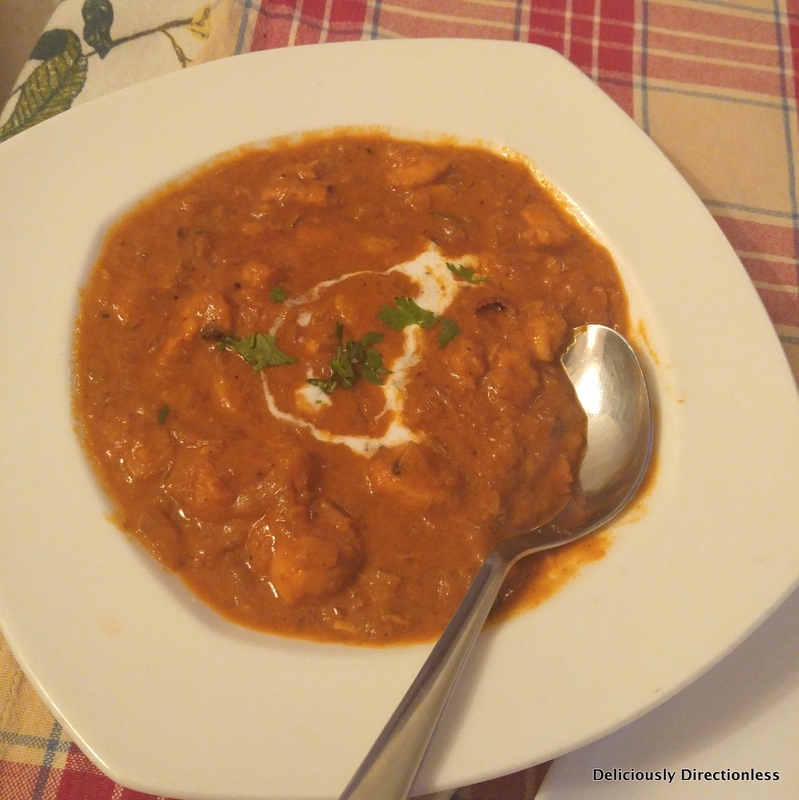 However, the two dishes we tried (Creole Seafood Soup & Creole Seafood Curry) had nothing ‘creole’ about them apart from the name – the former tasted like a Mangalorean gassi and the latter like an unidentifiable North Indian curry. 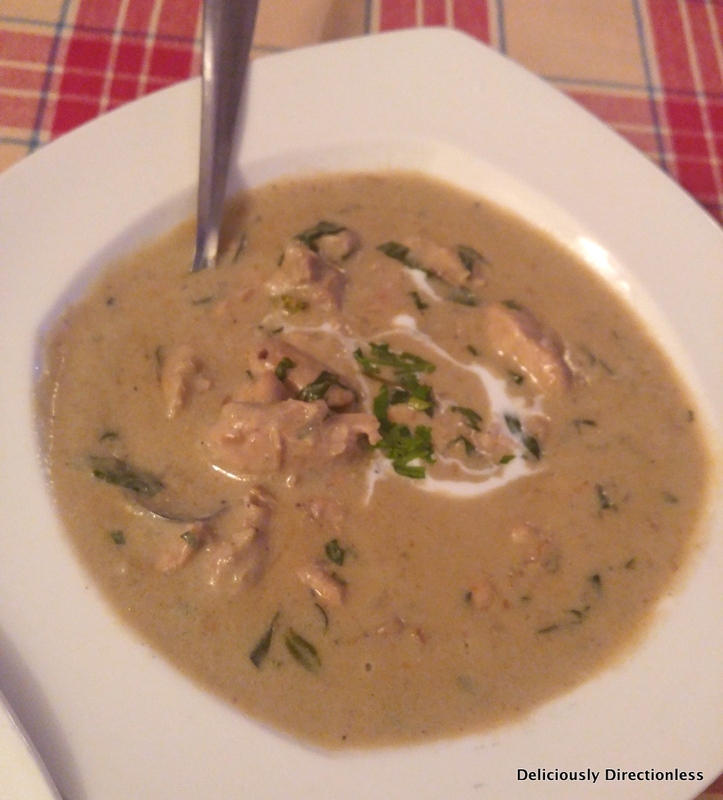 We also tried the ‘Traditional Pondicherry White Chicken Curry’, which was delicately spiced and had a coconut undertone. Don’t get me wrong, the food was good, very home style and the portions were large, but whether it’s actually Creole is deabatable. 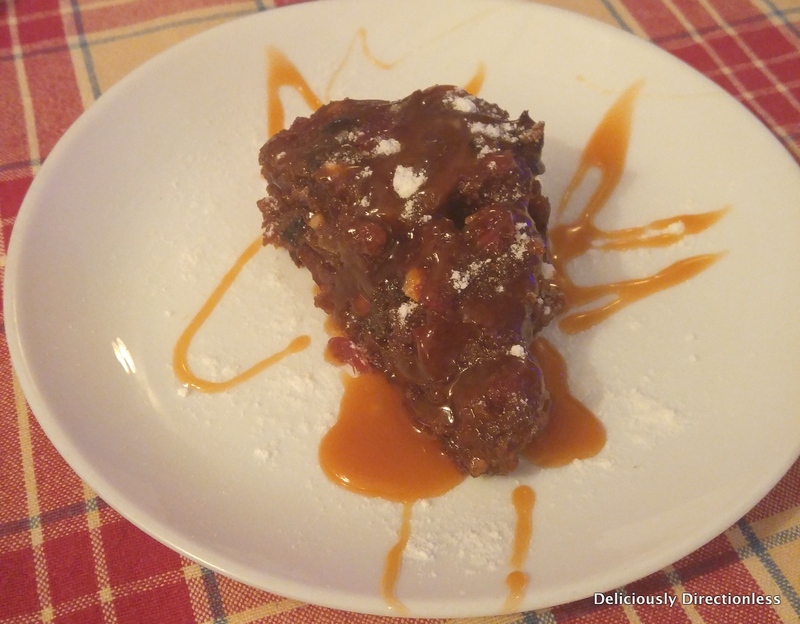 Our dessert was brilliant, though – a sticky, caramel-laced Traditional Christmas Pudding. Have you been to Pondicherry? Which was your favourite restaurant? Leave us a comment below.